There are a few items I've seen passing on the internet that I absolutely love and wanted to blog about. The autumn/winter collections are slowly but surely filling the racks of the stores and even if the sun is still giving its best I'm already looking for a nice pair of boots and a gorgeous coat to keep me warm in Winter. Bloggers are starting to chat about the new a/w collections that they've seen on the runways and that's what I'm going to do. Here is the first and quick little post about three things I'm absolutely loving! 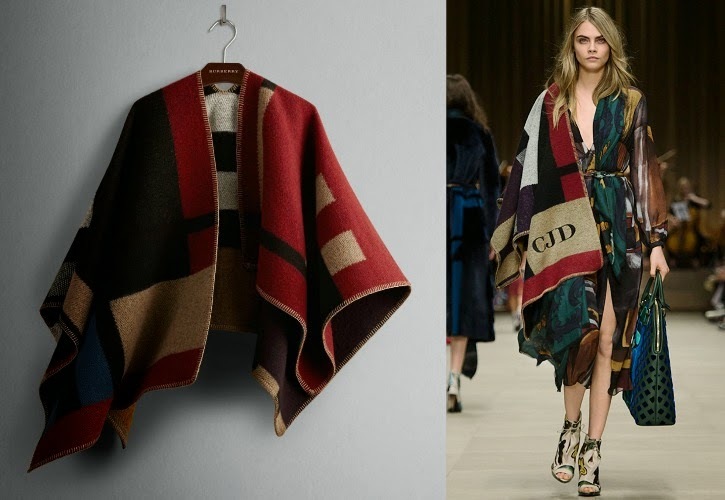 This gorgeous Burberry poncho Cara Delevigne wore on their show. This just screams fall to me! A big blanket that you can throw on when you're a little chilly while sipping a hot chocolate (with marshmallows of course). I can really picture myself wearing this on a snowy day walking the dog in the country side with rainboots and a felt fedora hat. Sadly I'll probably never own this because of its somewhat expensive price tag of €1.050 (auwtch, my dream just got shattered). But if I win the lottery, I'll definitely have this hanging in my closet. (please God, bear with me). I love me some Mulberry AND bucket bags. If these two collab, you get this. A beautiful bag called the Kensington. Still classy, but a little more exciting than the normal black bag. The colour/leather is absolutely gorgeous and it has a certain casual look to it. Right up my alley but sadly I haven't won the lottery yet. With a pricetag of a little under €2000 it's a 'bit' over my budget. 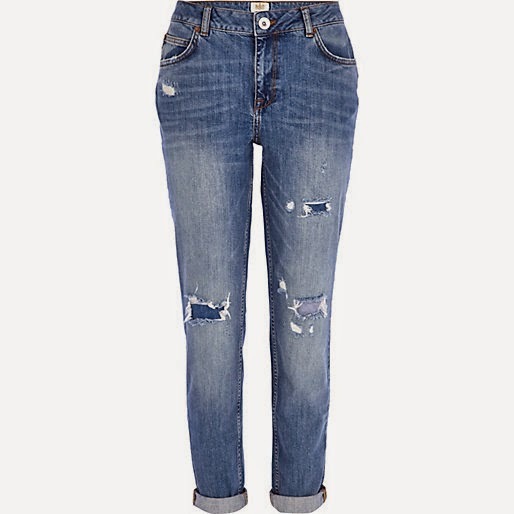 And last but not least are these River Island Light Wash Ashley Slim Boyfriend jeans. I've always loved the effortless look of the boyfriend style but never thought I could pull it off, but when I saw these on asos I convinced myself I should try it out. Because they're the 'slim boyfriend jeans' they look a little more feminine than the really baggy ones, perfect to wear with a pair of pointy toe heels, a white blouse with statement necklace, a beautiful clutch and a pair of big sunglasses. I don't have to tell you that I'll probably order them soon (since they are the more affordable out of the three), I see a haul coming up here! 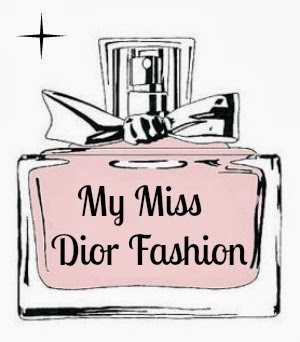 Do you have any fashion faves you're absolutely in love with?